This was written on June 27 as part of our offseason opponent preview series. We're republishing it this week ahead of the Huskers' Sept. 8 meeting with Colorado. Most of it holds up pretty well still, but here are a few updates just to provide context on what Colorado did in its Aug. 31 opener against Colorado State. Quarterback Steven Montez had himself a game, throwing for 338 yards and four touchdowns while completing 88 percent of his passes (22-for-25, 13.5 yards per attempt). He ran for another 34 yards and a score on the ground. Nearly two-thirds of Montez's passing yardage went to sophomore wideout Laviska Shenault Jr., who finished the day with 11 catches for 211 yards and a score. He had seven catches for 168 yards all of 2017. Another 112 yards went to sophomore wideout K.D. Nixon. Nixon was primarily a return man in 2017. Later on in this piece, it's mentioned that most of Montez's top targets from a season ago left, so it would be imperative for some new weapons to emerge. Seems like they have. As for the defense, the jury is still out on that. Colorado State is an objectively terrible football team at the moment. In two games to begin the season, the Rams have given up 88 points, 1,213 yards on an 8.8 yards-per-play average, seven passing touchdowns and they've only produced three turnovers. The offense has yet to produce a single rushing touchdown on the ground, is averaging 3.4 yards a carry and after a 500-yard passing performance in Week 1, collapsed in Week 2. Saturday should be a better gauge of Colorado's ability. Hello and welcome to the first ever piece of content written in which Colorado quarterback Steven Montez is compared to NBA person and Isaiah Thomas’ best friend, Kevin Love. During his first full season as the team’s starter in 2017, Montez was an honorable mention All-Pac-12 selection, had the third-most passing yards in a single season in school history (2,975) and became the first Colorado quarterback to go three consecutive games with more than 300 yards passing. His yardage total put him sixth in the Pac-12 but, wait for it, he was behind future NFL first-rounders in Sam Darnold and Josh Rosen and a Wazzu quarterback that logged 157 more attempts but only 618 more yards. That’s one good day on NCAA 14. The Buffs went 5-7. And that was right on the heels of a surprise 10-4 year in 2016. Not so good anymore. For those that don’t follow the basketball as much as the football, Kevin Love (a Pac-12 product; hey, more parallels!) played six years in Minnesota and once he took over the starting position full-time in year three, he was a nightly threat for 30 points and 20 boards. Problem was he never made the Playoffs. Since being traded to Cleveland in 2014, he’s made not just the playoffs but The Finals all four years but has yet to average above 19 points a game in a season. If there was a Good Stats, Bad Team Mt. Rushmore, Love would probably be on it. Why is this being brought up? Because Montez was a GSBT player in 2017 and it’ll take some serious work to prevent it from becoming a trend in 2018. The Buffs will be looking to replace running back Phillip Lindsay along with all 1,474 of his rushing yards from a season ago. The leading returning rusher had 61 yards at a 2.9 yards-per-carry average which is a somewhat noticeable drop-off. The offense had fits of explosiveness in the ground game (63 total explosive carries) but wasn’t efficient, ranking 89th in the country in rushing yards per play, so now having to replace the top producer complicates the situation. There are options — including a Virginia Tech graduate transfer in Travon McMillian — but those options are largely youthful and unproven. At wide receiver, only one of Montez’s top five targets from a year ago returns — Jay MacIntyre, son of head coach Mike MacIntyre. Jay had 28 catches, 396 yards and two touchdowns. He had a target rate of 11 percent. For perspective, that’s about 2017 Tyler Hoppes. Again, there are options here and what looks to be plenty of athleticism but those options have pretty green ledgers. Up front, four of seven guys to have started at least five games last year return. And last year, with all that continuity and experience, the offense was still bad. Bad in explosiveness (109th in explosive play percentage), bad in efficiency (80th in yards per play), bad at finishing drives (98th in points per trip inside the opponent’s 40) and bad at completing the single most important task an offense is asked to do, scoring (81st in points per game). Now take away your leading rusher, most of the top of your wide receiver production chart, a few linemen and the burden that your quarterback will have to shoulder becomes larger. That GSBT reference starting to make a bit more sense now? 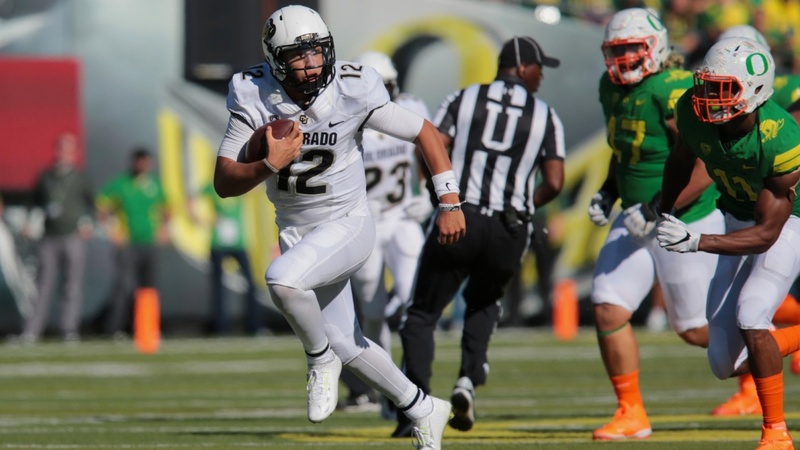 Montez will have to be the driving force behind whatever Colorado accomplishes this season. Might not have much help from the other side either. Colorado gave up 5.7 rushing yards a play in 2017 and a defensive opportunity rate (5 yards are available to the offense and the defense gives those 5 yards up) that ranked 114th in the country at 43 percent. So, run it on first-and-10 and odds were it brought up about a second-and-5. Let’s say the offense runs it again and gets it to third-and-short. What now? Play-action pass? Perhaps. The Buffs gave up an explosive pass 17 percent of the time and ranked seventh in the Pac-12. Or maybe just stay on the ground. On third (or fourth down) with 2 yards or less to go, Colorado’s defense yielded a first down or a score 75 percent of the time. That ranked 107th in the country. There wasn’t much of a pass rush and the run defense went from pretty good in 2016 to awful in 2017. And of last year’s top six havoc-creating defenders, only two return and they both play safety. Both inside linebackers — Rick Gamboa and Drew Lewis — return as well as two nose tackles and an end but when the product was as bad as it was last season, is that really a good thing? Who knows? Colorado’s defense could very well be in the same situation as Nebraska’s. The defensive coordinator in 2016 had a vastly different approach to defending than the defensive coordinator in 2017 (can you see the strain?). Jim Leavitt (2016) was efficient-focused and aggressive. DJ Eliot (2017) is more about big-play prevention. That’s a hard change to make on the fly. We’ll see how things look in 2018. ESPN’s Football Power Index has Colorado at 79th — predicted to finish 4-8 — and S&P+ has it at 89th — also 4-8. So, maybe the Good Stats, Bad Team thing becomes an actual thing, but Colorado is hoping for a little more love.